The Mechanics of a Conversion | ASTRALCOM - Content Strategy, Conversion Marketing and Customer Acquisition. Content Marketing, Customer Experience & Conversions | ASTRALCOM – Content Strategy, Conversion Marketing and Customer Acquisition. Engaging content delivers a good CTR and an inspiring customer experience produces a higher conversion rate. It is important to note that the Four C’s have been listed in order. 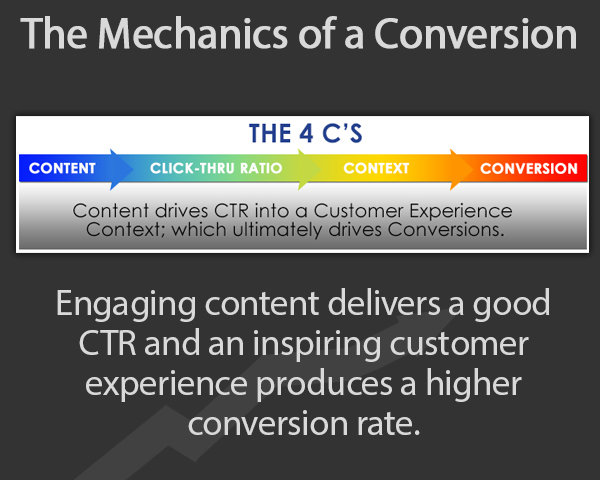 Content drives CTR into a Customer Experience context; which ultimately drives Conversions. Learn more about how we deliver higher conversions and check out our latest customer journey white paper, “The Digital Journey to a New Home Purchase” here.